This "wet spot" is located on Anegada, a remote island with fantastic fishing and beaches. If you don't have a boat, catch the ferry from Tortola and head over. The bar is on the beach serving their famous "Cow Killer" cocktail, as well as lunch and dinner. Cow Wreck Bar provides some of the best conch fritters, grilled steak and seafood around! 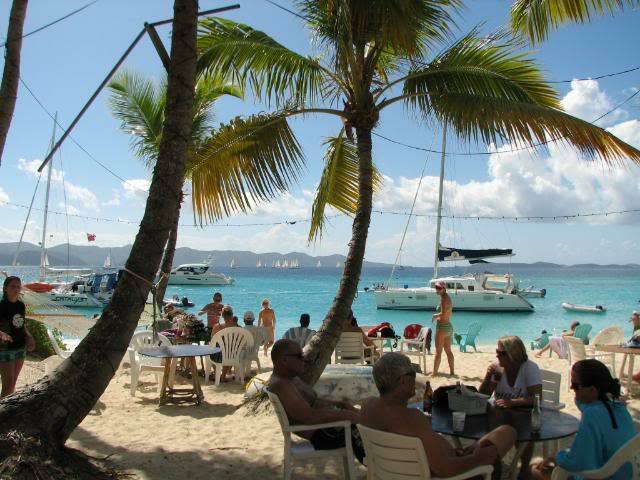 Foxy's Bar - Jost Van Dyke is open every day at 9:30 am, two hours before the kitchen opens. Sounds like they have their priorities right! With fresh draft beers from the microbrewery and their specialty drinks made with their own rum, Foxy's will not disappoint! Every Friday and Saturday the grill is fired up for a delicious Caribbean barbecue, but the kitchen is always open. If you can't get here in your own boat, ferries are available to take you to the only microbrewery in the Virgin Islands. (pictured on right) This "wet spot" got its name because most of its customers are coming off of boats and their dollars are soggy. After wading through the clear blue waters, a "Painkiller" is the drink of choice. This is the real deal, a true tropical "wet spot"!